The Secrets of Skullcano Adventure ebook combines reading with video games for kids, as they solve a cybercrime and become the hero of the story. Atlanta, GA, February 19, 2018 --(PR.com)-- Parents and grandparents of young readers aged 9-12 will welcome this newest edition of Uncle PoleCat and his cyber adventures. 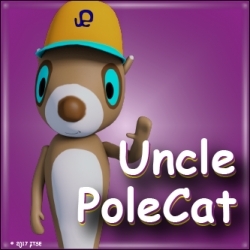 "The idea of Uncle PoleCat as a super hero character in a children’s video game story goes back 20 years to a time when I was snowed-in with five high-energy kids in a cabin in Austria. I made up the story to keep them occupied and they loved it," says Samuel Laguna. "One of the little girls there that day, now an adult, encouraged me to write more stories about Uncle PoleCat so that other kids could experience the same joy she had felt all those years ago." Taking full advantage of today's eBook publishing technology, this edition of Uncle PoleCat is the most entertaining and interactive of all. The eBook incorporates music, videos, problem-solving, and even has a glossary of technology terms including Bitcoin, Encryption, and many others. Preparing the future generation for careers in technology is part of the mission of this book. Using the state of the art iBook publishing platform enables young readers to have fun and learn at the same time, making time spent with this book positive screen time for them. It's not just a kid's game - it's a hands-on interactive cyber-adventure that's fun for them and parents can feel good about their child spending time with Uncle PoleCat. To purchase this eBook for a young reader in your life, go to http://bit.ly/Skullcano. Samuel Laguna is a retired technology executive. For most of his career, Sam was an elite troubleshooter working with Chief Information Officers. He’s been around the world many times and has worked with all types of technologies and cultures. Known for his creativity and ability to relate to people at all levels (especially kids), Sam started writing children’s eBooks combining his love of storytelling and technology with today's digital publishing capabilities. The Secrets of Skullcano Adventure eBook combines reading with video games for kids, as they solve a cyber-crime and become the hero of the story.